Author contributions: Iizuka M contributed to the study conception, design and data acquisition and drafting of the paper; Konno S contributed to the data analysis and interpretation and revised the paper. The intestinal epithelial cells (IECs) form a selective permeability barrier separating luminal content from underlying tissues. Upon injury, the intestinal epithelium undergoes a wound healing process. Intestinal wound healing is dependent on the balance of three cellular events; restitution, proliferation, and differentiation of epithelial cells adjacent to the wounded area. Previous studies have shown that various regulatory peptides, including growth factors and cytokines, modulate intestinal epithelial wound healing. Recent studies have revealed that novel factors, which include toll-like receptors (TLRs), regulatory peptides, particular dietary factors, and some gastroprotective agents, also modulate intestinal epithelial wound repair. Among these factors, the activation of TLRs by commensal bacteria is suggested to play an essential role in the maintenance of gut homeostasis. Recent studies suggest that mutations and dysregulation of TLRs could be major contributing factors in the predisposition and perpetuation of inflammatory bowel disease. Additionally, studies have shown that specific signaling pathways are involved in IEC wound repair. 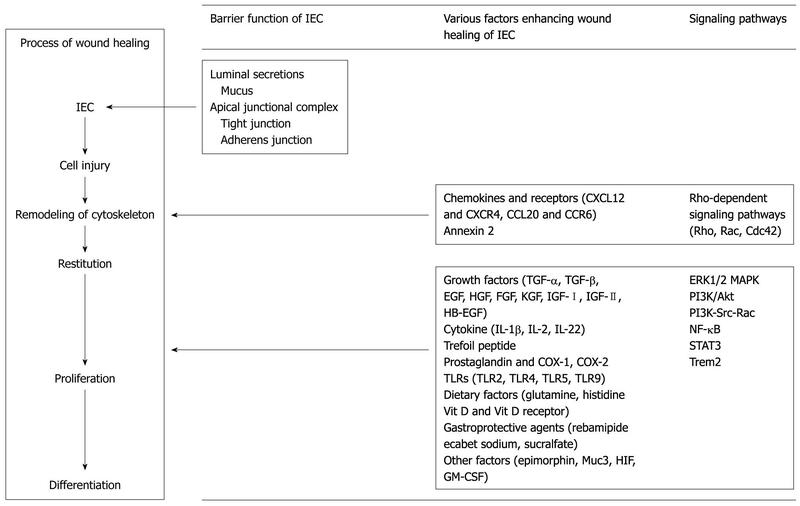 In this review, we summarize the function of IECs, the process of intestinal epithelial wound healing, and the functions and mechanisms of the various factors that contribute to gut homeostasis and intestinal epithelial wound healing. The surface of the gastrointestinal tract is covered with epithelial cells that function under physiological conditions as a barrier preventing undesirable luminal antigens from entering the body. Upon injury, the intestinal epithelium undergoes a wound healing process. Intestinal wound healing is dependent on the precise balance of migration, proliferation, and differentiation of the epithelial cells adjacent to the wounded area. Previous studies have shown that various regulatory peptides, including growth factors and cytokines, modulate intestinal epithelial wound healing. Recent studies have revealed that novel factors, which include toll-like receptors (TLRs), regulatory peptides, particular dietary factors[6,7], and some gastroprotective agents[8-10], also modulate intestinal epithelial wound repair. In addition, it has been shown that the activation of specific signaling pathways is involved in intestinal epithelial wound healing[11,12]. Ulcerative colitis (UC) and Crohn’s disease (CD) are chronic inflammatory intestinal disorders and known as inflammatory bowel disease (IBD). Although an etiology of both diseases remains unknown, it is suggested that disruption of the intestinal barrier function and repeated intestinal epithelial damage are key features of IBD, as well as other intestinal disorders[1,3]. In this context, it is suggested that the identification of the specific factors that improve wound healing of the intestinal epithelium might contribute to therapeutic strategies in IBD, and many studies using animal colitis models and intestinal epithelial cell (IEC) lines have been conducted. We summarize the function of intestinal epithelium, the process of intestinal epithelial wound healing, and the functions and mechanisms of the various factors that contribute to intestinal epithelial wound healing and gut homeostasis. We also discuss the association of some of these factors with IBD. The intestinal epithelial cells (IECs) form a selective permeability barrier separating luminal content from underlying tissues[1,13]. The gastrointestinal epithelial lining consists of a monolayer of columnar cells. This monolayer of IECs is constantly moving at a speed of 5-10 μm/h and is renewed every 2-5 d. The maintenance of this barrier is critical for normal growth, development, and disease prevention. Normally, IECs function as a barrier that prevents undesirable solutes, microorganisms, viruses, and luminal antigens from entering the body[1,16]. Several elements that participate in the barrier function include the epithelial cells themselves along with tight junctions, adherens junctions, and luminal secretions such as mucus or unstirred layers on the apical aspects of the epithelium. Tight junctions function as semi-permeable gates that regulate the passive movement of luminal fluid and solutes through the paracellular pathway, and limit passive diffusion of proteins and lipids between the outer leaflet of the apical and basolateral plasma membrane domains[1,17]. Subjacent to tight junctions, adherens junctions are important in regulating intercellular adhesion. Both tight junctions and adherens junctions are positioned in the apical end of the lateral plasma membrane, and are intimately linked in their regulation and function. Thus, the tight junctions and adherens junctions are collectively referred to as the apical junctional complex (AJC)[1,13,17]. Major transmembrane proteins in the AJC include occludin, claudins, junctional adhesion molecules (JAMs), coxsackie adenovirus receptor (CAR), and E-cadherin. Subjacent to the AJC are spot-like intercellular junctions referred to as desmosomes; the function of which in IECs is poorly understood. Despite the barrier function of IECs, this barrier has to allow some non-pathological gut-derived bacteria access to the immune system, thereby promoting maturation of the immune system and evolution of immune tolerance. As is described later, recent studies have demonstrated that the activation of TLRs by commensal bacteria plays an essential role in inhibiting inflammatory responses and maintaining colonic homeostasis. The intestinal epithelium can be injured by toxic luminal substances, normal digestion, inflammation, interactions with microbes, oxidative stress, and pharmaceuticals, despite its barrier function[19,20]. After injury, the intestinal epithelium undergoes a wound healing process. Intestinal wound healing is dependent on the precise balance of migration, proliferation, and differentiation of the epithelial cells adjacent to the wounded area. First, epithelial cells surrounding the wound lose their columnar polarity, take on a flattened morphology, and rapidly migrate into the denuded area to restore barrier integrity. This process has been termed “epithelial restitution”[3,15,21]. Restitution starts within minutes to hours of injury and is independent of proliferation[3,21]. Then, proliferation of the mucosal epithelium to increase the pool of enterocytes available to resurface the defect generally begins hours or days after the injury. Finally, maturation and differentiation of epithelial cells is needed to maintain the mucosal barrier function. Rat IECs (IEC-6) at 24 h after wound formation are shown in Figure 1A. Most of the epithelial cells found in the wounded area across the wound border are thought to have migrated in the process of restitution. The process of repair of IEC-6 cells wounded by mechanical cell denudation is shown in Figure 1B. These wound assays were performed in our laboratory. Figure 1 Wounded rat intestinal epithelial cell-6 cells. A: Confluent monolayers of intestinal epithelial cell (IEC)-6 cells were wounded with a razor blade. Wounded IEC-6 cells 24 h after wound formation. Wound line is shown with an arrow; B: IEC-6 cells wounded by mechanical cell denudation (× 40). Wounded cells at 0, 24 and 72 h after wound formation are shown; C: Wound margin of IEC-6 cells (× 200). During the restitution of IECs, extensive reorganization of the actin cytoskeleton is necessary. The organization and remodeling of the actin cytoskeleton is suggested to be controlled by the Rho family of small GTPases, which includes Rho, Rac and Cdc42. These proteins have been implicated in the formation of stress fibers, lamellipodia (cytoskeletal protein actin projection on the mobile edge of the cell), and filopodia (slender cytoplasmic projections, similar to lamellipodia, which extend from the leading edge of migrating cells). In detail, Rho regulates stress fibers and focal adhesion assembly; Rac regulates the formation of lamellipodia protrusions and membrane ruffles; and Cdc42 triggers filopodial extensions at the cell periphery[24,25]. The wound margin of IEC-6 cells is shown in Figure 1C. Lamellipodia- and filopodia-like epithelial cells are found at the leading edge of the wounded IEC-6 cells (Figure 1C). Other investigations regarding the mechanism of cell migration have also been reported[26-28]. Chemokines can be subdivided into distinct inflammatory or homeostatic subsets, with the latter being minimally regulated by pro-inflammatory cytokine stimulation. It has been shown in leukocytes that Rho-GTPase regulates homeostatic chemokine receptor CXCR4-mediated chemotaxis or metastasis to the sites of cognate ligand CXCL12 production. Moyer et al have demonstrated that CXCL12 increases Rho-GTP and F-actin localization to the leading edge of wounded IEC-6 and T84 monolayers. Since Rho-GTP is known to be required for membrane protrusions in intestinal cell lines, it has been postulated that CXCR4-mediated activation and localization of Rho at the leading edge of restitutive epithelial cells may facilitate the formation of lamellae that are required for wound healing. It has also been suggested that CXCR4 and CXCL12 function as an autocrine and paracrine mucosal signaling network that regulates the competency of the epithelial barrier to withstand injury and mediate repair following damage. Defensins are highly conserved key molecules that participate in host defense through the direct killing of microbes. Like the homeostatic chemokine receptor CXCR4, the chemokine receptor CCR6 is expressed by immature dendritic cells and circulating T cells, which directs their trafficking to sites of inflammation following binding by the chemokine ligand CCL20[19,32]. Vongsa et al have demonstrated that human β-defensins and CCL20 stimulated accumulation of F-actin, phosphorylation of the myosin light chain and RhoA, and restitutive migration of IEC-6 cells. These findings suggest that chemokines and β-defensins are protective host defense molecules that function not only to recruit immune cells and kill microbes, but also to increase the efficiency of wound healing in the gut. Annexin 2 is a calcium-dependent phospholipid-binding protein that also plays a role in regulating the actin cytoskeleton, and has been implicated in cell migration[33,34]. It has been shown that annexin 2 regulates IEC migration and wound closure through Rho-dependent signaling pathways and related actin cytoskeletal remodeling. We have summarized various factors that can have specific effects on IEC or intestinal mucosal wound healing in Table 1. Table 1 Various factors promoting or inhibiting wound healing of intestinal epithelium and mucosa. COX: Cyclooxygenase; TGF: Transforming growth factor; EGF: Epidermal growth factor; HB-EGF: Heparin-binding epidermal growth factor; HGF: Hepatocyte growth factor; FGF: Fibroblast growth factor; KGF: Keratinocyte growth factor; IGF: Insulin-like growth factor; IL: Interleukin; IFN: Interferon; PDGF: Platelet-derived growth factor; TLR: Toll-like receptor; HIF: Hypoxia-inducible factor; GM-CSF: Granulocyte-macrophage colony stimulating factor; TNF: Tumor necrosis factor. Previous studies have shown that various growth factors [including transforming growth factor (TGF)-α and TGF-β, epidermal growth factor (EGF), hepatocyte growth factor (HGF), fibroblast growth factor (FGF), keratinocyte growth factor (KGF), insulin-like growth factor (IGF)-I and IGF-II], the cytokine interleukin (IL)-1β and IL-2, and trefoil peptides enhance restitution or proliferation of IECs[3,21,35-42]. In contrast, platelet-derived growth factor (PDGF), IL-6, and tumor necrosis factor (TNF)-α have no effect on cell migration. With regard to interferon (IFN)-γ, a previous study has shown that IFN-γ enhanced epithelial cell restitution by 3.8-fold. However, a recent study has shown that IFN-γ inhibits enterocyte migration by preventing inter-enterocyte gap junction communication. Among the regulatory peptides, TGF-β is known to be a central factor that intrinsically contributes to the restitution of wounded IECs, although it inhibits IEC proliferation. It is noteworthy that cytokines (IL-1β, IL-2), EGF, FGF, HGF and TGF-α promote epithelial cell restitution through enhanced production of bioactive TGF-β, namely, the TGF-β-dependent pathway[21,35,36,41]. On the other hand, it has been shown that both trefoil peptides, which are secreted onto the surface of the gastrointestinal tract, and galectin-2 and -4, which ameliorate colitis in several models of intestinal inflammation, promote IEC restitution through a TGF-β independent pathway[42,43]. In contrast, TGF-α mediates its stimulatory effects on the proliferation and restitution of IECs through different mechanisms; as described above, it enhances IEC restitution through a TGF-β-dependent pathway but promotes IEC proliferation through the activation of extracellular signal-regulated kinase (ERK)1/ERK2 mitogen-activated protein kinase (MAPK). It has been shown that the activation of specific signaling pathways is involved in intestinal epithelial wound repair. El-Assal et al have demonstrated that heparin-binding epidermal growth factor-like growth factor (HB-EGF) enhances restitution of the intestine in vivo and in vitro in a phosphatidylinositol 3-kinase (PI3K)/Akt- and MAPK/ERK kinase (MEK)/ERK1/2-dependent fashion. Using mouse epithelial cell lines, Dise et al have shown that the PI3K and Src signaling cascades cooperate with Rac and promote IEC migration in response to EGF. Other studies have shown that the activation of the ERK1/2 MAPK or PI3/Akt pathway plays an important role in the regulation of intestinal epithelial proliferation, survival, and wound healing[12,45-47]. Recent studies have suggested that nuclear factor (NF)-κB has not only pro-inflammatory but also has a tissue-protective function in IECs. In addition, Pickert et al have reported using conditional knockout mice with an IEC-specific deletion of signal transducer and activator of transcription (STAT) 3 activity that intestinal epithelial STAT3 activation regulates immune homeostasis in the gut by promoting IL-22 dependent mucosal wound healing. Trem2 is a cell surface receptor that is specifically induced in macrophages by IL-4/IL-13. Seno et al have shown that Trem2 signaling promotes efficient wound healing of colonic mucosal injuries by inhibiting cytokines that can enhance M1 macrophage activation, and by promoting cytokines that can promote M2 macrophage activation. E2 plays a major role in the regeneration of the epithelial crypts and in the prevention of decreased epithelial cells proliferation after radiation- or dextran sodium sulfate (DSS)-induced intestinal injury[51,52]. Mucosal PGs are synthesized from arachidonate by cyclooxygenase (COX)-1 or COX-2. Thus, it has also been shown that COX-1 and COX-2 share a crucial role in the defense of the intestinal mucosa[53,54]. In this context, Brun et al have shown that the neuropeptide neurotensin (NT) significantly increases COX-2 mRNA levels and stimulates PGE2 release in the colonic cell line HT29. They also have shown that NT significantly enhances the migration of HT-29 cells into the denuded area of a wound model. It has also been shown that PGE2 reduces radiation-induced apoptosis in the intestine through transactivation of the EGFR, enhanced activation of Akt, and reduced Bax translocation from the cytoplasm to the mitochondria. Epithelial-mesenchymal interactions are necessary for proper gut morphogenesis. These interactions also play important roles in intestinal epithelial wound healing. Epimorphin is expressed on the surface of mesenchymal cells in various organs, including intestinal mucosa, and is suggested to play a key role in the morphogenesis of epithelial cells[58,59]. We found that epimorphin also has a novel function to promote restitution of IECs under oxidative stress conditions through the activation of the EGF receptor and MEK/ERK, PI3K/Akt signals. HGF, FGF and KGF are also secreted by mesenchymal cells. Göke et al have shown that fibroblasts, which are derived from primitive mesenchyme, promote intestinal cell proliferation in addition to affecting secretory responses, differentiation, and morphogenesis, and that this function is predominantly mediated by the paracrine action of HGF. Recent studies using experimental colitis models have shown that the Muc3 mucin cysteine-rich domain, hypoxia-inducible factor (HIF), and granulocyte-macrophage colony stimulating factor (GM-CSF) improve wound healing of the colonic mucosa. We summarize the various factors and signaling pathways that contribute to intestinal epithelial and mucosal wound healing in Figure 2. Figure 2 Various factors and signaling pathways contributing to the process of wound healing of intestinal epithelial cells and intestinal mucosa. IEC: Intestinal epithelial cell; TGF: Transforming growth factor; EGF: Epidermal growth factor; HGF: Hepatocyte growth factor; FGF: Fibroblast growth factor; KGF: Keratinocyte growth factor; IGF: Insulin-like growth factor; HB-EGF: Heparin-binding epidermal growth factor; IL: Interleukin; COX: Cyclooxygenase; TLR: Toll-like receptor; HIF: Hypoxia-inducible factor; GM-CSF: Granulocyte-macrophage colony stimulating factor; ERK: Extracellular signal-regulated kinase; MAPK: Mitogen-activated protein kinase; PI3K: Phosphatidylinositol 3-kinase; NF: Nuclear factor; STAT: Signal transducer and activator of transcription. Several studies have shown that enteral nutrition with an elemental diet is efficacious in the treatment of CD, especially for maintaining clinical remission or reducing clinical and endoscopic recurrence after resection[65-67]. Although some of this effectiveness may be due to the low antigenic load, low fat content, and modulation of the commensal bacterial flow, the precise mechanisms remain unclear. In this context, the effectiveness of the constituent amino acids of the elemental diet for intestinal epithelial and mucosal wound healing has been reported. Glutamine, the most abundant free amino acid in the bloodstream, is a non-essential amino acid that is essential for gut homeostasis and is an essential respiratory substrate for cells in the small intestinal mucosa[68,69]. Enteral glutamine is thought to stimulate intestinal mucosal protein synthesis and protect against apoptosis. Larson et al have shown that glutamine supplementation stimulates IEC growth and prevents apoptosis, and that activation of ERK is an important contributor to glutamine-mediated intestinal cell survival. Sukhotnik et al have evaluated the preventive effects of oral glutamine supplementation in an intestinal ischemia-reperfusion injury in a rat. It was found that pretreatment with oral glutamine prevents mucosal injury and improves intestinal recovery following ischemia-reperfusion injury through the stimulation of cell proliferation rather than the inhibition of cell apoptosis. On the other hand, Andou et al have assessed the role of histidine, an essential amino acid, in controlling colitis by using an IL-10-deficient cell transfer model. In this study, it was shown that dietary histidine reduced histological damage of the colon and TNF-α mRNA expression by inhibiting NF-κB activation, following the downregulation of pro-inflammatory cytokine production by macrophages. Son et al also have reported that histidine significantly inhibits both hydrogen peroxide- and TNF-α-induced IL-8 secretion and mRNA expression in intestinal epithelial-like cell lines. This study has also shown that histidine abolishes the NF-κB-dependent activation of the IL-8 promoter induced by TNF-α, suggesting that histidine has the potential to attenuate intestinal inflammation. These reports investigating the function of glutamine and histidine have suggested the efficacy of an elemental diet for improvement of intestinal mucosal wound healing in patients with CD. Previous studies have suggested a link between vitamin D deficiency and IBD risk. Kong et al have investigated the role of the vitamin D receptor (VDR) in mucosal barrier homeostasis by using the DSS-induced colitis model. In this study VDR+/+ mice were mostly resistant to 2.5% DSS, but VDR-/- mice developed severe colitis, leading to death. They also found severe disruption in the epithelial junctions in VDR-/- mice after DSS treatment. 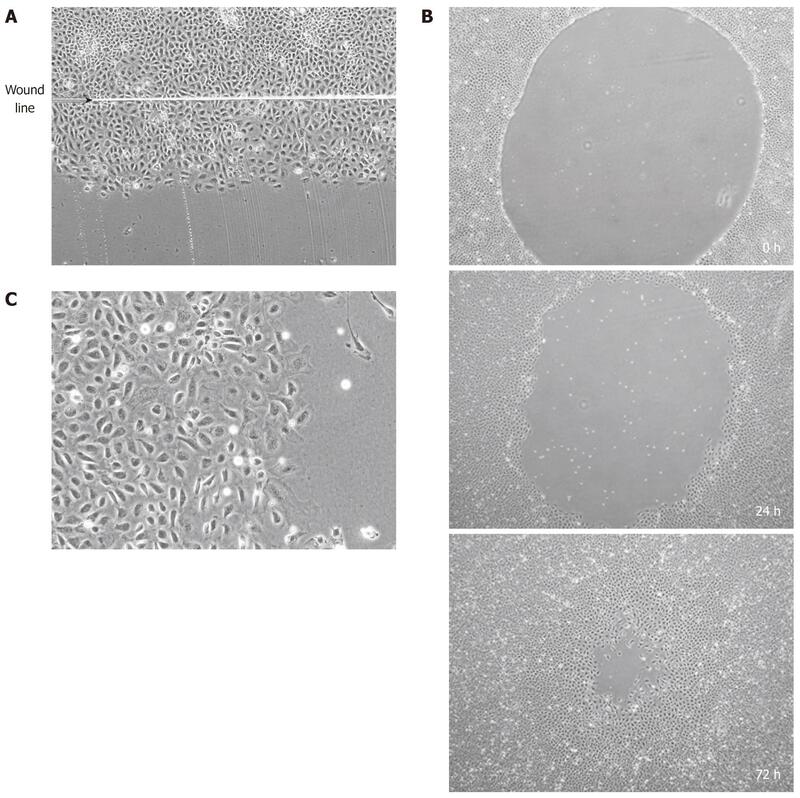 In cell cultures, 1,25-dihydroxy-vitamin D3 [1,25(OH)2D3] markedly enhanced tight junctions and stimulated epithelial cell migration in vitro. These observations suggest that VDR plays a critical role in mucosal barrier homeostasis by preserving the integrity of junction complexes and the healing capacity of the colonic epithelium. Recent studies have shown that some gastroprotective agents, including ecabet sodium (ES), rebamipid, and sucralfate, have therapeutic effects on IBD and other types of colitis[73-76]. Previous studies have shown that rebamipide enema is effective for treatment of experimental DSS-induced colitis in rats[8,77]. Okayama et al have suggested that the protective effect of rebamipide may be attributable to both the radical scavenging action and the increase in the production of mucus in the colon. Watanabe et al have performed wound assays using gastric epithelial cells and have shown that rebamipide prevents delay of wound repair induced by hydrogen peroxide. On the other hand, Sasaki et al have investigated the therapeutic mechanism of ES for intestinal mucosal injury by using the rat IEC-6 cell line. The investigation clarified that ES prevents the delay of wound repair in IEC-6 cells induced by hydrogen peroxide, probably through the activation of ERK 1/2 MAPK and the induction of COX-2. Takagi et al have shown that intracolonic administration of ES accelerates TNBS-induced ulcer healing in vivo. Shindo et al have investigated the therapeutic mechanism of sucralfate for intestinal mucosal injury. It has been demonstrated that sucralfate also prevents the delay of wound repair in IEC-6 cells induced by hydrogen peroxide through the induction of COX-2 and an anti-apoptotic mechanism. The effects of sucralfate may be initiated by the activation of the NF-κB pathway. These studies have suggested the possibility that some gastroprotective agents could be used for the treatment of IBD. The commensal bacteria population is comprised of at least 400 species, with a load of as many as 1012 bacteria per gram of intestinal content. As described previously, IECs are the first line of defense against commensal or pathogenic luminal microflora. Recognition of enteric bacteria is mediated by several mechanisms, the most important of which rely on host receptors specific for conserved bacterial structures not found in the host. The two major host receptors currently recognized in humans are TLRs and the nucleotide-binding oligomerization domain (NOD)-containing proteins. In this context, it is notable that mutations in NOD2, a cytoplasmic innate immune-recognition receptor, are associated with susceptibility to CD[82,83]. TLRs are innate immune-recognition receptors that bind a spectrum of pathogen-associated molecular patterns (PAMPs) present in pathogenic and commensal bacteria and viruses, as well as some endogenous proteins[84-86]. TLR family members were first noted to be expressed by immune cells such as monocytes and dendritic cells[84-86], then, it was shown that IECs also express TLRs. With regard to the association of TLRs with IBD, several studies have shown the alteration of TLR expression and the specific antibody to the TLR ligand in patients with IBD. First, Cario et al reported the upregulation of TLR4 in IECs in UC and CD, and the downregulation of TLR3 in CD. A recent study has shown the association between the TLR2 polymorphism R753Q and the severe UC phenotype. Such associations have also been found between the TLR4 polymorphism at Asp299Gly and the development of CD and UC, and the TLR4 polymorphism at Thr399Ile and UC[89,90]. On the other hand, the presence of high titers of flagellin-specific antibodies in the serum of CD patients has been reported. The following in vivo and in vitro studies have provided evidence that each TLR contributes to intestinal homeostasis and intestinal mucosal repair. TLR2 recognizes lipoproteins derived from a variety of bacteria, peptidoglycan, lipoteichoic acid from many Gram-positive bacteria, and lipopolysaccharide (LPS) from Leptospira and Porphyromonas gingivalis. Cario et al have shown that TLR2 stimulation effectively preserves the tight junction-associated barrier assembly in IECs against stress-induced damage, and suppresses mucosal inflammation and apoptosis of IECs in vivo. The same group has shown that TLR2 controls gap junction intercellular communication and commensal-mediated intestinal epithelial wound repair by modulating intestinal epithelial connexin-43. Furthermore, they have shown that TLR2 controls terminal goblet cell differentiation by selectively regulating trefoil factor 3 expression in the intestine and confers anti-apoptotic protection to the intestinal mucosa. TLR3 recognizes double-stranded RNA, which is a molecular pattern associated with viral infection. A recent study has shown that administration of TLR3 ligand polyinosinic acid: cytidylic acid protects against DSS-induced colitis. In contrast, Sato et al have performed wound assays using IEC-6 cells and have shown that TLR3 ligand rotavirus double-stranded RNA induces apoptosis and diminishes wound repair of IECs in vitro. TLR4 recognizes LPS that is an integral component of the outer membranes of Gram-negative bacteria. Using DSS-induced colitis mice, Rakoff-Nahoum et al have demonstrated that commensal bacteria are recognized by TLRs (TLR2 and TLR4) under normal steady-state conditions, and that this interaction plays a crucial role in the maintenance of intestinal epithelial homeostasis. They have shown that activation of TLRs by either the TLR2 or TLR4 ligand is critical for the protection against gut injury and associated mortality. This group has also shown that TLR-mediated signaling plays a critical role in intestinal inflammation in the context of deficiency in the anti-inflammatory cytokine IL-10, but not in the context of insufficient activity of regulatory T cells. Another study using a murine colitis model also has shown that TLR4 is important in intestinal response to injury and in limiting bacterial translocation. On the other hand, Cetin et al have reported that LPS inhibits IEC-6 cell migration through a RhoA-dependent increase in focal adhesions and enhanced cell adhesiveness. Flagellin, the primary structural component of bacterial flagella, is recognized by TLR5 present on the basolateral surface of IECs. A recent study has shown that, in salmonella infections, flagellin plays a dominant role in the activation of not only innate immunity but also anti-apoptotic processes in epithelial cells. The same group also has shown that pretreatment of epithelial cells with flagellin can protect cells from a subsequent bacterium-mediated apoptotic challenge through the activation of NF-κB and PI3K/Akt signaling. These studies suggest that the TLR5 ligand flagellin has a fundamental cytoprotective effect in inflammatory stress. TLR9, an intracellular protein in immune cells, is expressed on the surfaces of IECs, both on the apical and basolateral membrane. TLR9 recognizes CpG motifs, derived from bacterial DNA. Recent studies have demonstrated that TLR-9 signaling in IECs contributes to colonic homeostasis[18,103-105]. Katakura et al have shown that TLR9 agonist suppresses the severity of experimental colitis by inducing type I IFN (IFN-α/β). The same group also has shown that administration of probiotics (non-viable irradiated or viable probiotics) ameliorates the severity of DSS-induced colitis. They have suggested that TLR9 signaling is essential in mediating the anti-inflammatory effect of probiotics, and that live microorganisms are not required to attenuate experimental colitis. They have shown that while basolateral TLR9 signaling is fully capable of inducing an NF-κB-mediated pro-inflammatory response, apical TLR9 signaling does not induce an inflammatory response due to a defect in NF-κB activation[18,104]. They have suggested that stimulation of apical TLR9 compromises the inflammatory cascade induced basolaterally by several other TLR ligands, and thus, apical exposure to luminal microbial DNA restrains intestinal inflammation and supports colonic homeostasis via the activation of TLR9. In conclusion, most of these studies investigating the function of TLRs strongly suggest the possibility that the activation of TLRs by commensal bacteria plays an essential role in maintaining colonic homeostasis and protection of IECs from gut injury. These studies also support the therapeutic efficacy of some antibiotics[106-108] or probiotics in IBD patients. Thus, modulations of host-commensal interactions via TLRs might be targeted for optimal therapeutic strategies in IBD.